Fenghuang More Inn is located in Fenghuang. Free WiFi access is available. Each room here will provide you with a satellite TV and air conditioning. Featuring a shower, private bathroom also comes with a hairdryer and free toiletries. Extras include a desk and cleaning products. At Fenghuang More Inn you will find a mini-market. Other facilities offered at the property include grocery deliveries, ticketing service and a tour desk. Please note that the property will charge CNY 30 per room per day if guest needs the air conditioning on in room. Located in the heart of Fenghuang ancient town. Nice and tidy room. Very nice staff. Introduce us to a very good local restaurant called " Xiangxi Shiji" near West Gate. A decent stay given the price. A helpful hostess as well. the hostess,Veronica, was helpful. location is good but difficult to find on your own. If arriving by bus, take a taxi from the bus station to the West Gate of the old town and phone Veronica. She will come to fetch you. Cars are not allowed in that part of the old town. The furnishings of the room is sparse, the wash room is poorly lit. Some people may not be able to handle the squat toilet. We loved this place! Veronica was super-helpful and kind, she helped us to buy tickets to the bus to Zhangjiajie and the through tickets for the town's attractions. And her English is great! And I should say that it wasn't hard to find the place as the booking's map is correct! I love everything about this place. Pet friendly, one of the workers, the chinese girl, search for me to meet me and take me to the hotel. The decoration is beautiful and the place is very centric. It´s really a lovely place that feels like home. Great hostess. She helped us with all our questions and sorting out the return trip to Guangzhou. The location was good - quiet but near to the action. Lady host gave us a map and good advice on where best to eat and answers to all our questions. Really good place to stay for English speaking tourists. Do follow her advice upon booking as the place is not easy to find, given that it is located in the alleys of the Old Town. The innkeepers are kind, they told me all the things they know about the ancient town with enough patience, and gave me a nice map that quite clear to understand. The room is clean, and the bed is good to sleep. It is not far from the river view, and easy to reach the tourist spots. A street with delicacies is nearby, so hungry is not a problem. Early in the morning, someone passing by the road beside the window, steps on the ancient tiles making a lot of noises that wake me up. Sometimes there also will be a group of tourists passing by with a lot of speakings. Or maybe it is just too silent, the noises sound like big ones. Perfect location, very nice host, totally recommended! The location is perfect, in the ancient part of the city. The host spoke very good english and was extremely kind to us, recommending us where to go eat breakfast, lunch, and what to see in the area. She let us get in first hour in the morning, which was really helpful, too, since our bus arrived at 8 AM. It's a comfortable hostel bang in the middle of the old town. The staff were extraordinarily friendly and helpful, and the owner has very good English. They had a pair of lovely old golden retrievers too. Expensive enough, but we stayed during a busy national holiday so that was to be expected. Certainly more reasonable than most hostels in the town that weekend. More Inn was a really great place to stay in Fenghuang, firstly I booked a hostel by riverside, room was very noisy and not so clean, staff there didn't speak English and I couldn' t communicate with them at all. I moved to More Inn the other day, the room was perfect, Veronica spoke really good English, she suggested me what to do and helped me arrange the transport to airport. The staff was really helpful. Without them we wouldn't have made it at our next destination. They booked the bus ticket in advance for us and we got the last two tickets. The toilets are chinese., like holes in the ground. Not a real problem but it requires a bit more effort. l'hotel è situato in posizione centrale nella città vecchia e vicino al fiume.Ho trovato il personale molto disponibile,che parlava un buon inglese e ci ha consigliato ristoranti e spettacoli. purtroppo per la sua posizione ci sono troppi gruppi di turisti che passano di lì e non si può riposare bene! Friendly owner, who spoke good english and gave us detailed information about what to see in Fenghuang, helped us book bus tickets. Helpful staff, organized bus tickets and music show tickets for us. Forget the rest stay here. Veronica is wonderful, she study in London so her English is very good. She helped us with finding suitable restaurant and wrote instructions for us in Chinese so we could order a meal. Nothing was any trouble. The location is near the main square. We had a private balcony which was great for happy hour. A lot of the hotels that over the look the river are noisy and over priced. A very authentic and enjoyable stay. 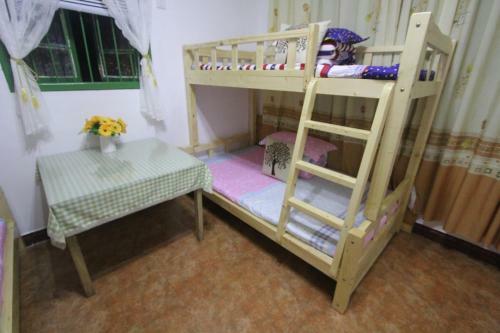 Like most beds in China, More Inn's bed is very firm. Muy cerca de lo interesante sin estar en plena aglomeración. El lugar es precioso y muy limpio, cómodo y acogedor. Verónica, la persona que te atiende, es un amor. Amable, simpática y dispuesta a ayudarte en todo lo que necesitas. Incluso nos hizo un regalo el día que nos fuimos. Se sabe que en este pueblo cobran por el aire acondicionado. Estad atentos de que quede registrado en la factura. Nice clean room. Hostess, Veronica, was very kind and super helpful! She speaks English very well. Veronica advised us to go to a Chinese musical show, based on a famous story of the city of Fenghuang, which was really nice! Hence we were only staying for a couple of nights, Veronica was able to help us organize things on short notice. The hostel isn't very easy to find so do follow the instructions as send by the hostel prior to your stay.. The hostel helped us by booking bus tickets. El hotel está muy bien situado, en la parte antigua de Fenghuang, cerca de todo, pero a la vez alejado del ruido que hay en la ciudad todas las noches (karaokes...). La dueña habla perfecto inglés y es super atenta, nos ayudó muchísimo en todo. Las habitaciones están limpias y son espaciosas, están equipadas con wifi, aire acondicionado, wc occidental... Lo recomiendo.